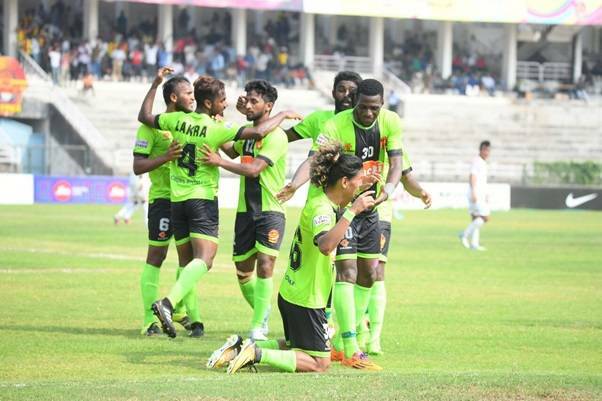 East Bengal went into the match having the momentum of beating Minerva Punjab FC in the crucial tie against Gokulam Kerala FC to stay in the hunt for I-League championship, desperately looking for 3 points. But a stellar show from Gokulam Kerala FC humbled East Bengal 2-1 at the EMS Corporation Stadium, Kozhikode on Saturday. Khalid Jamil strangely opted for a lone striker in the form of Dudu Omagbemi who has lost his pace and sheen with age and was found wanting at times as Gokulam FC midfielders weren’t shy at putting strong tackles in their half. Goukulam Coach Bino George’s tactical formation in the midfield successfully cut-off playmaker Al-Amna from feeding the forward line and the link up play between the midfield trio of Amna, Lobo and Katsumi was successfully thwarted. Both teams had some decent chances in the first half but failed to capitalize on the scoring opportunities but the stalemate was finally broken when Emmanuel Chigozie brought down Kevin Lobo into the box during the injury time of first half and the referee straight away pointed to the spot. Japanese midfielder made no mistake from the spot kick to give East Bengal crucial one-goal lead on the brink of halftime. Back in the second half, Gokulam FC maintained the major share of possession as they took control over the match from the beginning. Henry.Kivi, Irshad and Jayaraj were completely in control of the game as they made the East Bengal defence stretch from all sides.The pressure on the East Bengal defence finally paid off as Kivi Zhimonu scored the equalizer in the 51st minute for the home side with a powerful shot after Henry laid it off to Kivi. Henry did not enjoy the rub of the green himself and was denied by the woodwork couple of times as he could have easily scored back to back goals against the two Kolkata giants, coming fresh from scoring a brilliant goal against Mohun Bagan last week. First, his long-range screamer on the 76th minute and then followed by a thumping header on the 86th minute were both denied by the woodwork leaving the striker in dismay. As the match seemed to head for a draw some intelligent football by Gokulam FC secured the crucial winning goal for the Kerala side in the 87th minute.Henry was at the heart of the action again as the quick attack in the East Bengal box caught the East Bengal defenders out of shape and Henry played it onto Arjun Jayaraj who delivered a low cross but Salam Ranjan Singh failed to deal with cross and turned it into his own net to score a dreaded own-goal to give Gokulam FC a 2-1 lead. In the final minutes of the game, both teams were involved in some heated exchanges and strong tackles as both teams were reduced to 10-men as Irshad was red carded on 91st minute and Arnab Mondal earned his second yellow card on the 96th minute with a cynical tackle on Arjun Jayaraj. Gokulam Kerala FC secured a 2-1 win as they continue their late resurgence to hold 8th position in the league with 16 points while Khalid Jamil’s East Bengal would have a monumental task ahead as they let their momentum slip having secured 26 points from 15 games.